Motorists will be restricted to 40kmh in two of Sydney's major business districts in an attempt to curb the number of pedestrians being injured or killed. North Sydney Council will implement the new limit throughout its CBD by February - the first council in Australia to do so. As well, Willoughby Council is in the process of introducing a similar limit in the Chatswood business district. Between 1996 and 2000 about 550 pedestrians were killed or injured by cars in the two council areas. The chairman of the Pedestrian Council of Australia, Harold Scruby, applauded the new limits, saying he expected them to be enforced by speed cameras. "There's a very easy way of making people stick to this - by putting fixed speed cameras throughout the CBD," he said. "They will come." 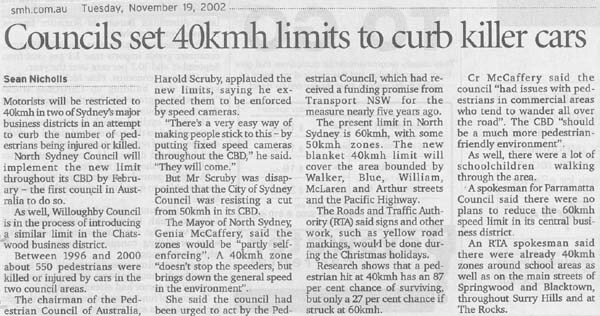 But Mr Scruby was disappointed that the City of Sydney Council was resisting a cut from 50kmh in its CBD. The Mayor of North Sydney, Genia McCaffery, said the zones would be "partly self-enforcing". A 40kmh zone "doesn't stop the speeders, but brings down the general speed in the environment". She said the council had been urged to act by the Pedestrian Council, which had received a funding promise from Transport NSW for the measure nearly five years ago. The present limit in North Sydney is 60kmh, with some 50kmh zones. The new blanket 40kmh limit will cover the area bounded by Walker; Blue, William, McLaren and Arthur streets and the Pacific Highway. The Roads and Traffic Authority (RTA) said signs and other work, such as yellow road markings, would be done during the Christmas holidays. Research shows that a pedestrian hit at 40kmh has an 87 cent chance of surviving per only a 27 per cent chance if struck at 60kmh. Cr McCaffery said the council "had issues with pedestrians in commercial areas who tend to wander all over the road". The CBD "should be a much more pedestrian friendly environment". As well, there were a lot of schoolchildren walking through the area. A spokesman for Parramatta Council said there were no plans to reduce the 60kmh speed limit in its central business district. An RTA spokesman said there were already 40kmh zones around school areas as well as on the main streets of Springwood and Blacktown, throughout Surry Hills and at The Rocks.